Spring has finally arrived, and along with those April showers and May flowers comes the natural sunlight you’ve been missing all winter long. With Silhouette shades from Hunter Douglas, you can make the most out of this natural light. At A Shade Above, our friendly experts can show you all your options for Silhouette sheer shadings and help you find the ones that are right for you. Stop by one of our beautiful showrooms today to see all that Silhouette sheers have to offer. Silhouette shades have been the leader in diffusing light for over 25 years. They are the only fabrics that are specially crafted to transform the natural light that enters your home into a soft ambient light. By diffusing the harsh spring sunlight that enters your home, Silhouette shades can soften that light and spread it around the room to provide better illumination. These beautiful sheers also protect your home from harmful UV rays, which could damage your flooring and furniture. This protection can help save you time and money, because you won’t have to replace your furnishings as often. Silhouettes are designed with soft s-shaped fabric vanes that seem to be floating between sheer fabric panels. This sheer fabric means your view to the outside won’t be obstructed, and it also manages to obscure the view into your home, increasing your privacy. You can also easily adjust the fabric vanes by tilting them to achieve the right amount of privacy and light control. 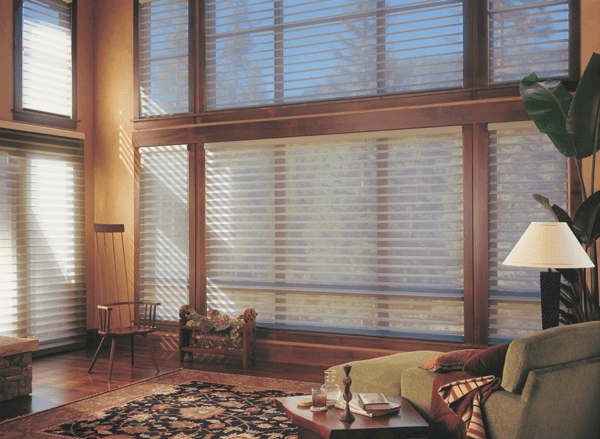 These shades can also be upgraded with PowerView® Motorization, so you can have your shades adjust automatically, based on a schedule you set, increasing your home’s security. Having your shades adjust automatically means that your home will always appear occupied, even when no one is there. Along with light control and privacy, Silhouette sheers offer softness and beauty to your home. They are crafted using only the highest-quality fabrics and materials. You can choose from a wide variety of fabrics and colors to achieve the desired aesthetic in your home. We also offer the option to add a liner to your sheer shadings, so you can darken a room when needed. These liners can be sewn directly into the shade, or they can be kept separate. Adding a liner can make these shades perfect for bedrooms and help give you a cohesive look across your entire home. If you want to add Silhouette shades to your home, come see us at A Shade Above. You can see our full line of beautiful Hunter Douglas window treatments at one of our showrooms, conveniently located in Charlotte and Cornelius, NC. If you can’t come to us, you can also schedule an appointment for an in-home consultation, where we will bring samples of our products into your home to help make your decision easier. We proudly serve the greater Charlotte area. Give us a today!